Several people have asked me to provide an update on the wetland restoration project I posted about last November. At that time, we’d just completed our second (last?) phase of the dirtwork to convert sand pit lakes to a stream channel and shallow wetlands. I wrote that we were trying to figure out what to do with a lot of sludge that had floated up from the bottom of the sand pit we’d filled in. Beggarticks (Bidens sp.) flowers accent a wetland swale that was part of the first phase of the restoration project back in 2001. The 2011 restoration project surrounds that initial phase. This photo was taken last week. Well, let’s see… Since November, the wetland has been very interesting to watch. We’ve seeded the site a couple times. Most of the non-sludge-covered area was seeded during the winter and then again in the summer, after many of the smaller wetland channels and pockets off of the main stream channel – that allowed us to get seed into areas previously under water. We’re starting to see a few plants come in as a result of those seedings, although the dominant vegetation in the most recently-restored portions of the wetland is still mainly annual plants that colonized on their own. The areas where we spread the “sludge” from the bottom of the old sandpit grew some pretty tall cannabis (marijuana) plants, along with other common annual weeds. We sprayed those areas several times to prevent the weeds from making seeds and to allow sunlight to keep hitting the ground. That sunlight seemed to help degrade the sludge, which was largely organic matter. 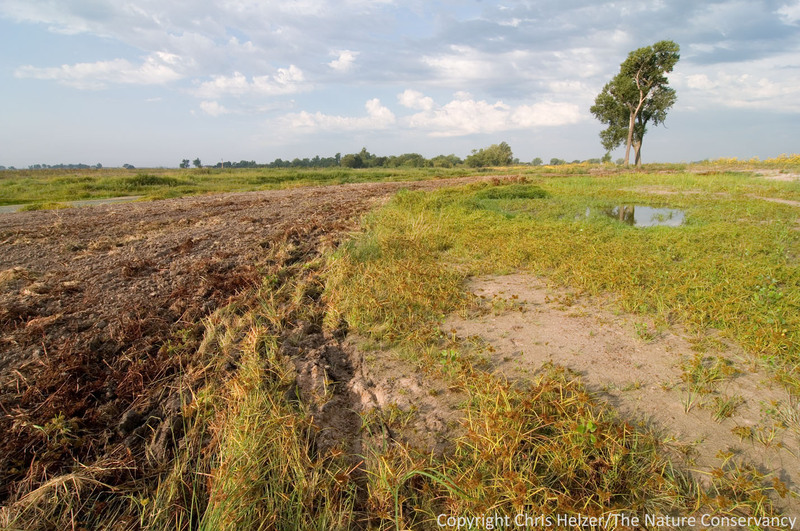 By late summer, the sludge appeared to have shrunk considerably in depth, and at the end of August, Tim Horst from Ducks Unlimited stopped by with his monster tractor and disk and disked the area up. That disking seemed to incorporate at least some of that sludge into the sandy substrate below – and, if nothing else, smoothed out the site enough that we can walk and drive equipment across it much more easily. We plan to seed that area this winter and see what happens next year. In late August, Ducks Unlimited staff disked up the area where we spread the sludge that floated up as filled in the old sandpit lakes. The disking smoothed out the site and incorporated some of the remaining organic matter into the sand below. This year’s drought helped drive home the value of this restoration. One of the reasons this site is so important is that there is something very special about its hydrology. In past drought years, the stream that passes through this wetland has gone dry just a few hundred yards upstream, but has always continued to flow in the area we’ve restored. In years like 2012, any standing and/or flowing water is extremely rare and valuable, so I’m really glad we were able to complete our restoration before this drought got started. Even during the height of the hot and dry weather in July and August, the stream continued to flow through our restoration site, supporting abundant aquatic and wetland plant and animal populations. At the time the site was disked much of it was dry, but the stream was still flowing through the restoration area, and a few pockets of adjacent wetland pools (right) still had some water. 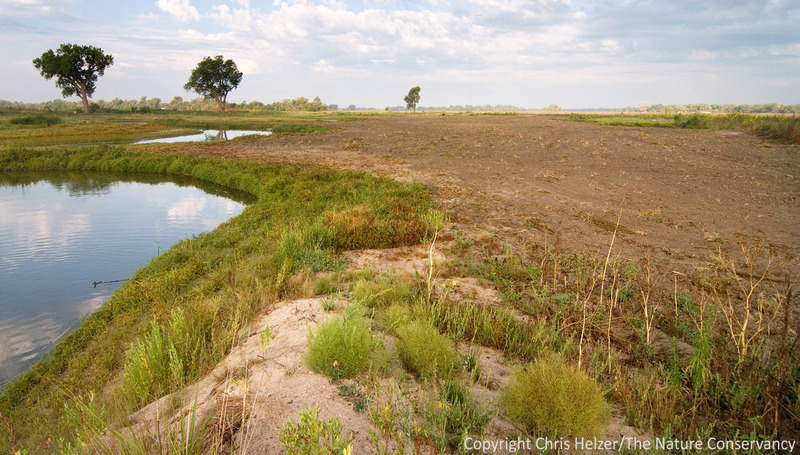 The wetland project is featured on the Platte Basin Timelapse website where you can watch a time lapse video that includes last fall’s dirtwork, congregations of waterfowl during spring migration and the first half of this summer’s drought. The site will continue to be updated over time. In addition, two more cameras were added this summer that will focus a little more closely on a different portion of the same site and capture changes over time. Complementing that visual data, we also have two university research projects (Kansas State University and the University of Nebraska’s Cooperative Wildlife Research Unit) that will be tracking changes in the water, sediment, and flora/fauna at the wetland. Beavers have dammed up some portions of the most active stream channel through the restoration area. This is now backing water into some adjacent low spots we created, making some very nice habitat for fish, aquatic invertebrates, and the wildlife that feed on them. In short, the project is going very well. I’m extremely satisfied with the way things look so far, and excited to see data from the time lapse cameras and university projects. During the last couple of months, beavers have moved in and made their own alterations to our existing plans – which is great. Great blue herons, kingfishers, sandpipers, soft-shelled turtles, schools of fish, and many other wildlife species are easy to find at the site. Next season should bring increased establishment of the plant species we’ve seeded. In the meantime, the short sparse vegetation in the newly restored portions of the wetland provides a nice complement to the portions we restored a decade ago, and the combination is very pleasant indeed. 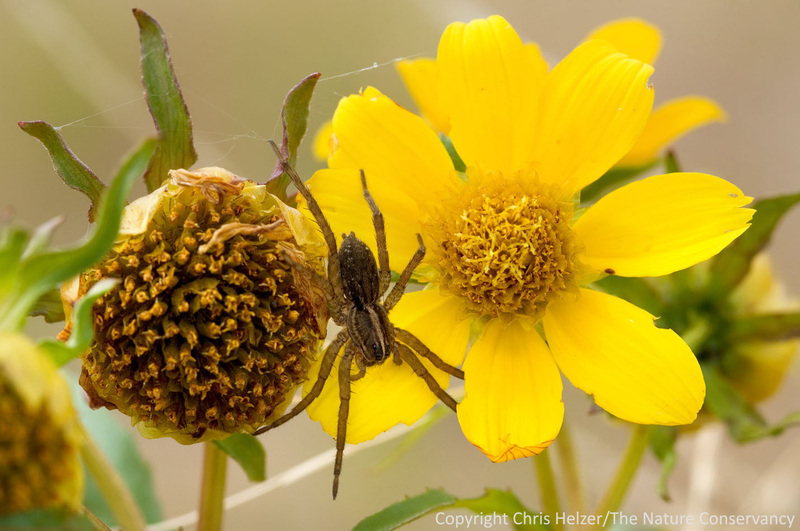 A wolf spider hunts on a beggarstick flower last week at our sandpit wetland restoration project. 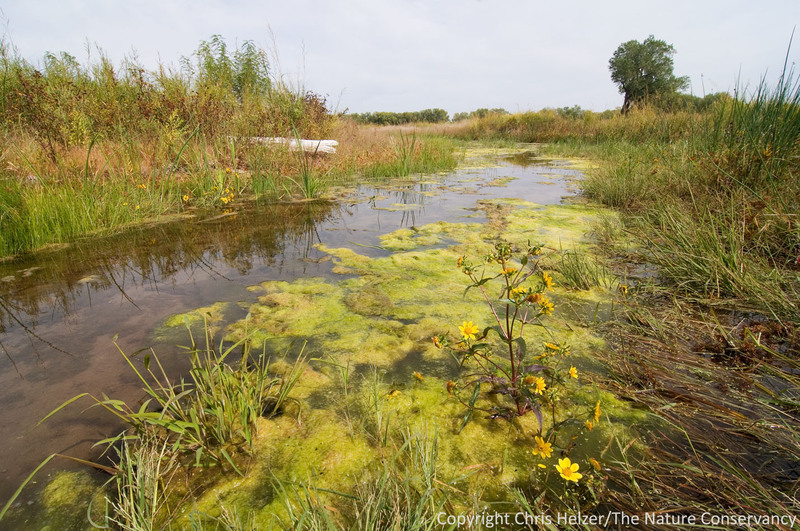 This entry was posted in General, Prairie Natural History, Prairie Photography, Prairie Restoration/Reconstruction and tagged derr sandpit, research, sand pit restoration, sludge, stream restoration, the nature conservancy, time lapse, update, wetland, wetland restoration by Chris Helzer. Bookmark the permalink. And before anyone asks.. yes, we have marijuana growing on our property, no, we’re not going to use it as a cash crop to support our work, and yes, it’s a common weed that pops up in most disturbed areas in this part of the world. I’ve been told the only thing your marijuana would be useful for is making rope. I’ve never tried the stuff myself. It does not seem like their would be much of a market for hemp anymore since most rope is made of nylon. Very interesting on how the restoration has affected the sites hydrology. It’s often difficult to predict what kind of effects soil disturbance, and vegetation establishment will have on hydrology, accurately. It’s good to see it’s benefiting the area so much during the current drought y’all are experiencing. Thanks for the update, and look forward to more in the future. Tim – to clarify, the hydrology of the site was excellent BEFORE the restoration. I don’t think the restoration really affected the ability of the stream to flow – we just recreated a stream channel and wetlands where lakes used to be. The fact that the stream continued to flow and wetlands always had water – even during dry periods – made this site a high priority for restoration because I wanted to take maximum advantage of that hydrology. Sorry for the confusion. So did it turn out that the drought was a blessing, allowing the sludge to dry and plants to establish and stabilize it a bit?? Seems like normal or above normal rain could have washed it back where it came from or downstream to ther unwanted locations. Inger – I think you’re right. The drought was pretty handy in that regard. It’s hard to know what would have happened with high water. I hope that an area of deeper water just downstream would have caught most of the sludge and allowed it to silt in that area rather than affecting anyone downstream.. We actually left a deep spot just for that reason, but I’m glad not to have had to test that! And I may be fooling myself that we’re out of the woods now. Maybe nothing but marijuana will grow on that sludge pile next year! I have a more general question about the response of shallow ponds to extended drought. Many of the ponds that normally hold water are dry and annuals seem to have filled in. Any thoughts about the ecological value of having these areas periodically dry out completely? Is it useful for oxidizing/decomposing the “sludge”? Will this make the pond more suitable for wildlife and resist eutrophication in coming years? Patrick – it’s a great question, but I’m not the right person to ask it of. My best guess is that drying out periodically might not have much impact on wildlife use compared to other factors (such as being wet at the right time, the kind of vegetation around it, etc.) but I really am just guessing. It’s an intriguing question… Maybe someone with more experience with organic matter in wetlands/ponds will chime in. At the Wild Things Conference in Chicago a few years ago, a professor of enviromental science gave a presentation about his experiments. He found that during the low water flow of summer, restored wetlands became a phosphorous emitters from decaying vegetation. This had the potential of causing fish killing algae blooms. This probably has little relation to Chris’ work since the studied wetlands were restored on very different soil in the Chicago area. It does seem like information worth passing a long. As for wildlife, we have found that ponds which periodically dry up do not have fish. This makes these ponds great places for amphibians and certain insects. 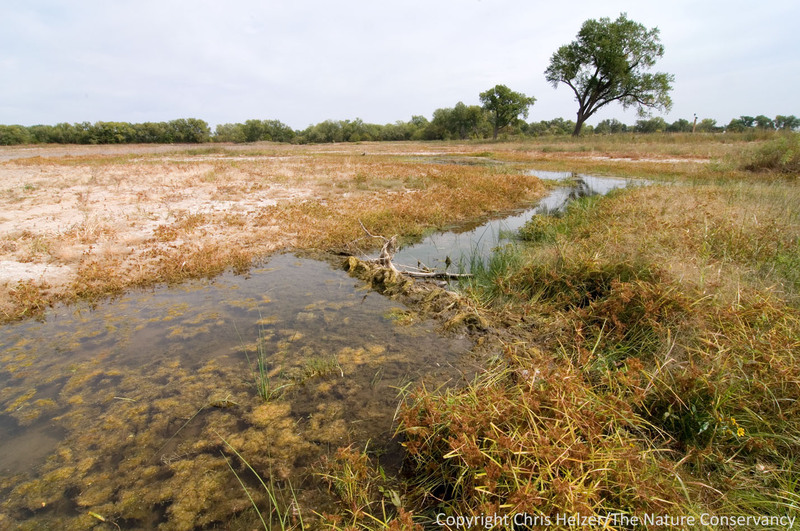 So to answer your question about wildlife, I would say a pond that driest up periodically makes it better habitat for a different set of wildlife species. Thanks for the posts. I agree there would be “winners” and “losers” as a result of ponds drying out. I hadn’t heard about the potential for algae blooms…it would be interesting to see if that is apparent in some of these ponds next year if or when the fill again. Thanks for sharing! It’s very cool to see the transformation from last year when I was in the area! Yep, it looks awfully different now! You’ll have to come see! The mary jane you speak of that growes every were and the mourning dove love to eat….was brought over from Eroupe by our for fathers just to make rope. If you are stupid enough to to smoke it…it will just give you headaches!!!! OH..and yes…lung problems!! !